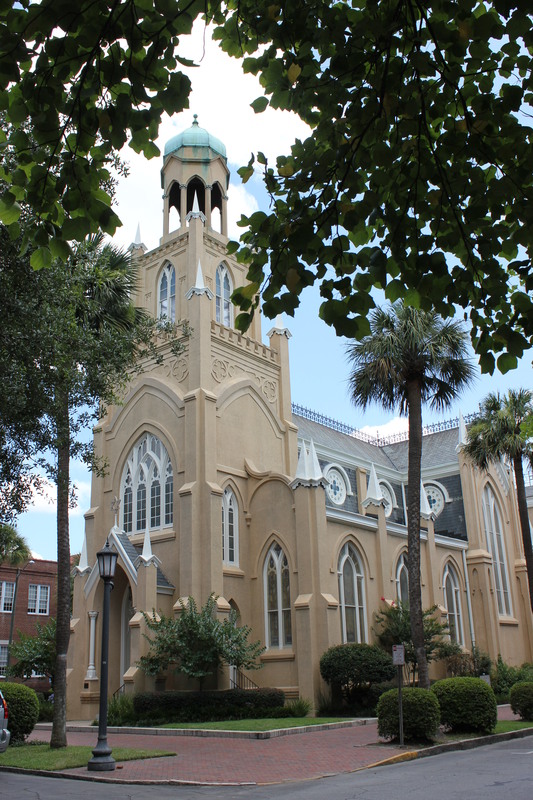 Charleston may be hailed as “The Holy City,” but Savannah has her fair share of historic houses of worship. Each of these churches has a fascinating and unique history and continues to stand as a testament to the city’s earliest men and women of faith. Many are open to tourists, though times vary from church to church. Catholics were originally prohibited by colonial charter from settling in Savannah for fear that they would give their allegiance to the Spanish colonies in Florida rather than to the English settlers in Georgia. That ended following the Revolutionary War and this congregation formed around 1796. Construction began on this majestic cathedral on Lafayette Square in 1873, but shortly after its completion it was ravaged by fire. With dedication and hard work the edifice was rebuilt within a year. 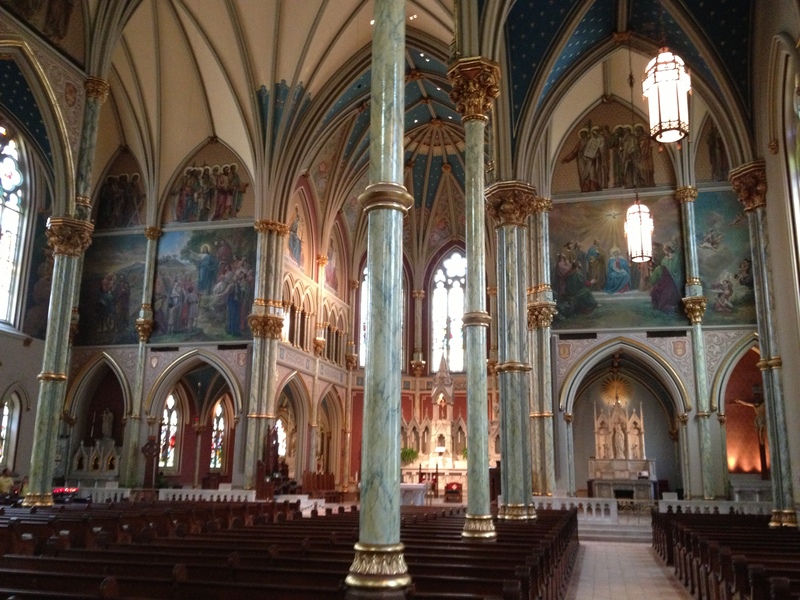 It is one of Savannah’s most ornate churches and is definitely worth a visit. 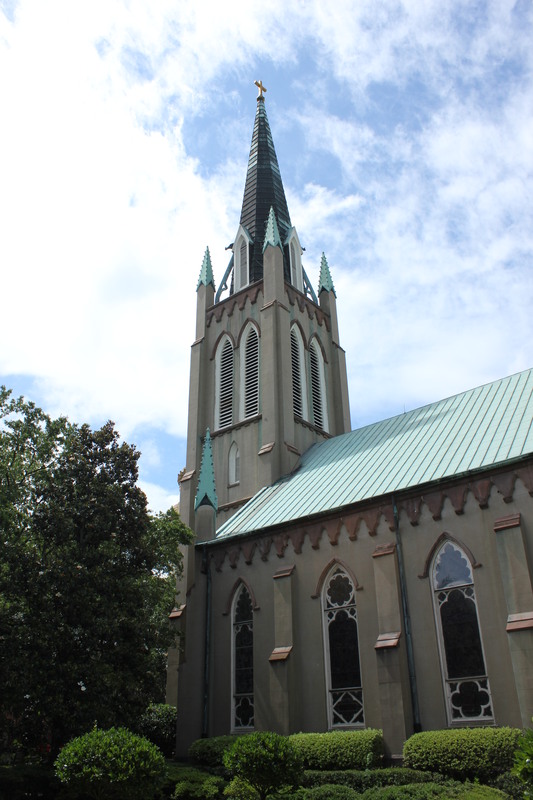 Located on Johnson Square, Christ Church is considered the “Mother Church of Georgia.” The current building dates to 1838 when it was erected on the trust lot designated by Oglethorpe as the site for the colony’s house of worship. John Wesley, the Father of Methodism and former rector of Christ Church, started America’s first Sunday School on this very spot. 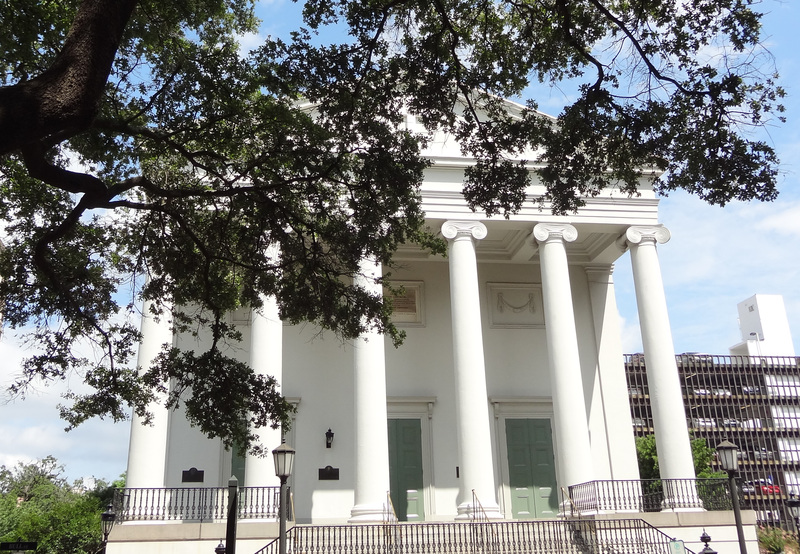 Situated on Savannah’s west side and overlooking Franklin Square, First African Baptist Church is home to the oldest black congregation in America. This building was constructed in the mid-1850s by freedman and slaves and served as a stop on the Underground Railroad. Runaway slaves are said to have been hidden underneath the floorboards, and holes in the floor (which are still there today) enabled them to breathe. 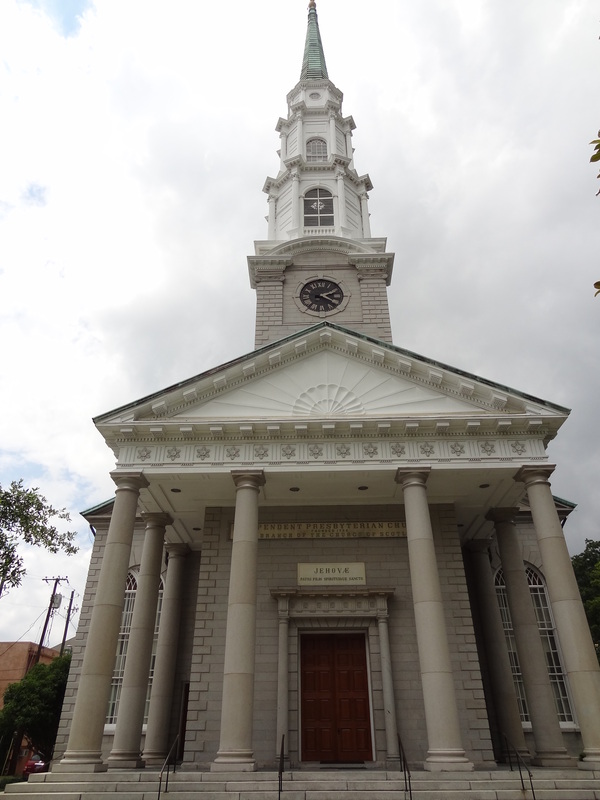 Built in 1833 on Chippewa Square, this stately church is a fine example of classic Greek Revival Architecture. 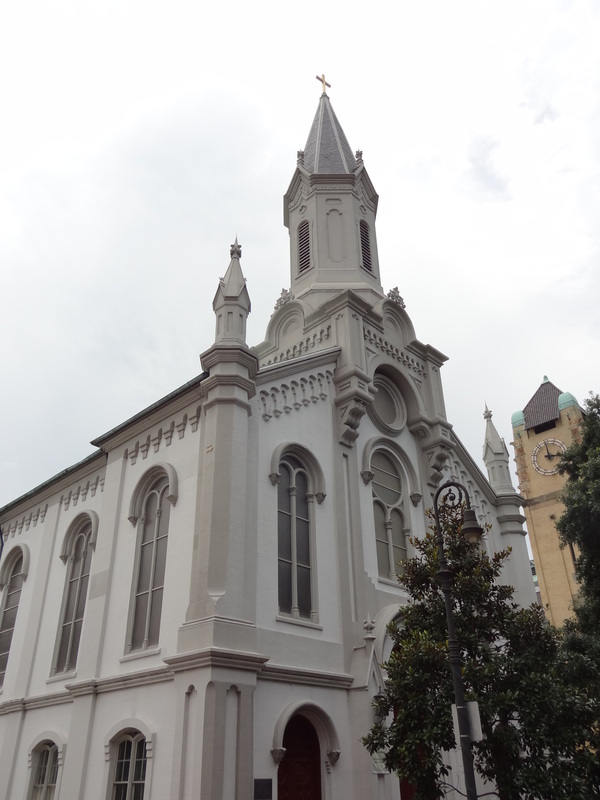 It is notably the oldest intact church building in Savannah, never having been damaged by fire or otherwise requiring reconstruction. This church was founded by Bavarian protestants who were exiled from their own country by Catholic authorities in the early 1700s. During the Civil War this building on Wright Square was used as a hospital, with pew cushions serving as beds and the pews themselves as firewood. Suffering extensive damage but not complete destruction, the church was renovated and refurbished between 1875 and 1879. The church’s crowning glory is a magnificent stained glass window in the sanctuary depicting the Ascension of Christ. Overlooking Madison Square, St. John’s Episcopal Church was organized as an expansion parish to Christ Church. Constructed less than a decade before the Civil War, it was occupied by Union chaplains during the conflict—even serving as a house of worship for Sherman and his troops, or so the story goes. St. John’s is known for its melodious bell chimes and beautiful stained-glass windows. 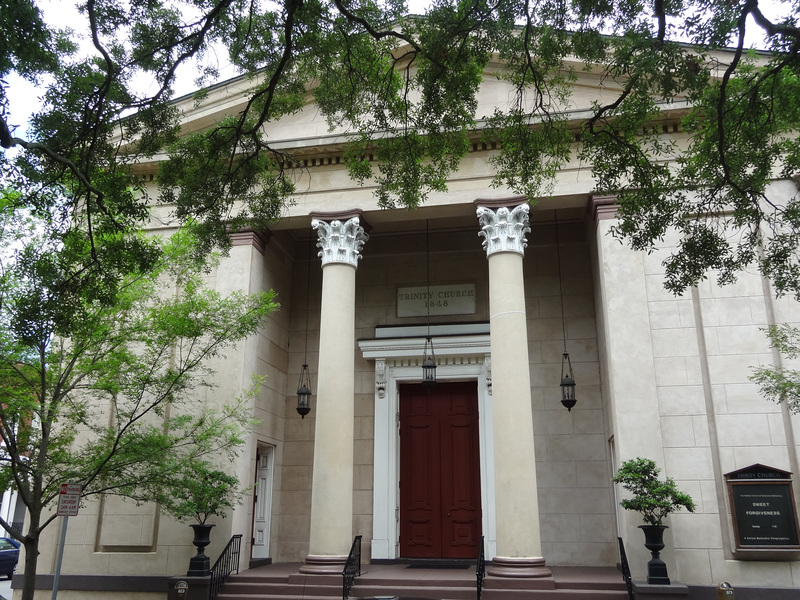 Sitting directly across Monterey Square from the infamous Mercer-Williams House, this Gothic-style synagogue is home to the third oldest Jewish congregation in the United States. Dating to 1878, the building houses a museum which contains a number of Jewish artifacts including the temple’s original 15th century Torah as well as letters written to the congregation by presidents Washington, Jefferson, and Madison. 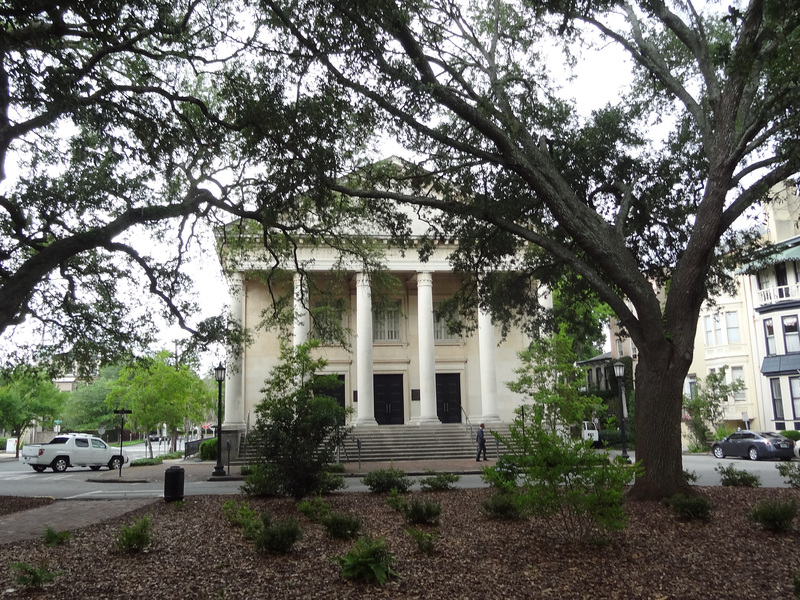 Overlooking Telfair Square, this dignified edifice is constructed of Savannah gray brick in the Greek Revival style. 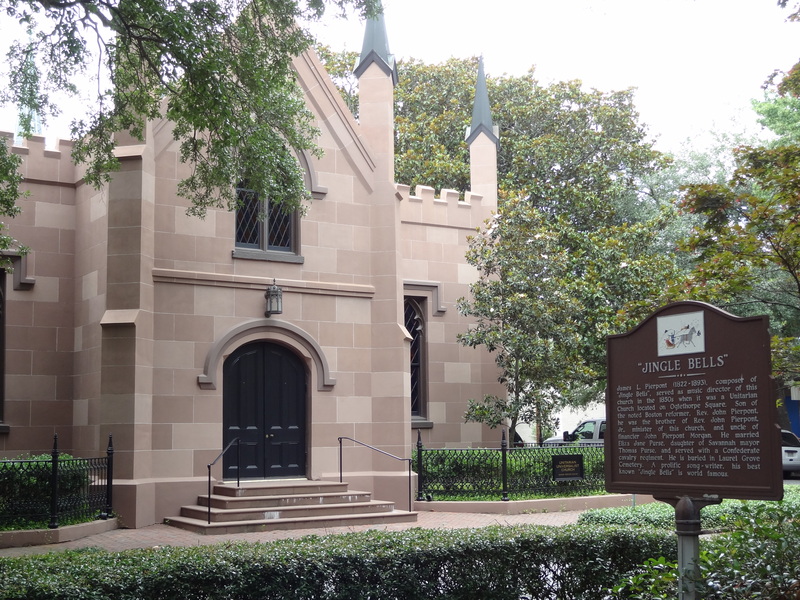 The present congregation is descended from the original Methodist church (Wesley Chapel) established in Savannah by John Wesley, the father of Methodism. This church building has a fascinating history. 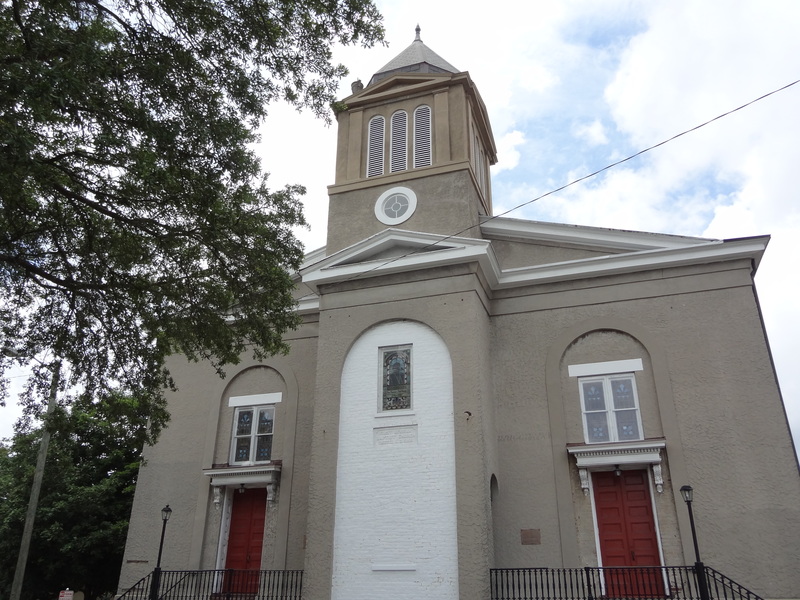 Originally constructed as a Unitarian Church, it is said to be the site upon which church organist, James Pierpont, composed his famous Christmas carol, “Jingle Bells.” The church’s strong abolitionist leaning led to its forced closure in the years leading up to the Civil War. The building was purchased by freed slaves in the post-war years to serve as the home of the first African Episcopal parish in Georgia. Ironically, it returned to the hands of the Unitarian Universalists in 1997. When choosing a travel destination, I often select a city that lends itself well to sightseeing on foot. (That way I can walk off all of the calories I take in sampling the local cuisine!) The Savannah historic district with its grid-type layout is packed with more interesting sights and photo ops than you can shake a stick at, and is relatively easy to navigate. If, however, you are directionally challenged like me and happen to wander off-course, just ask anyone, “Which way to River Street?” and remember that the river is always north. (Of course, a walking map is a good idea. Grab one at the visitor center or purchase one at Parker’s Market.) Much like Charleston to its north, Savannah is dotted with inviting gardens, intricately fashioned gates, and an abundance of finely crafted wrought iron. Be sure to allow enough time to wander up and down the streets in the historic residential areas in addition to the squares and main drags. You will find bits of beauty tucked into every nook and cranny—flower boxes, trellises, balconies, staircases, lamp posts, decorative grates, hitching posts, lanterns, and railings. It’s fun and it’s free! If your feet get tired, catch the express shuttle or take a trolley tour. There will likely be many other tourists out and about also, but as with anywhere you go, be aware of your surroundings and watch out for traffic! To see how Charleston compares, go to Wrought Iron Artistry…Charleston, S.C.
Parker’s Market Urban Gourmet: Cleverly disguised as a convenience store, this snappy little market is nestled in the Savannah historic district on Drayton Street. (There are additional Parker’s Markets at other locations, but I am referring specifically to the one on Drayton.) We stopped in daily to pick up coffee, pastries, bottled drinks, snacks, toiletry items, and even a fantastic guidebook (The Savannah Guidebook Including 4 Unique Walking Tours). 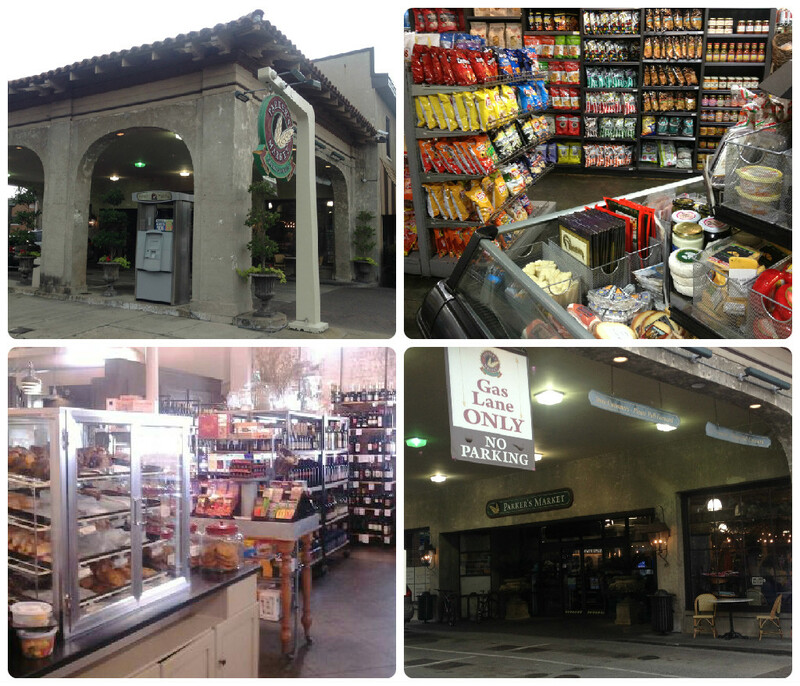 In addition to regular convenience store fare, Parker’s stocks souvenir items, home goods, deli meats and cheeses, fresh salads, and gourmet desserts. The staff members were friendly and helpful, and remembered us after only one visit! 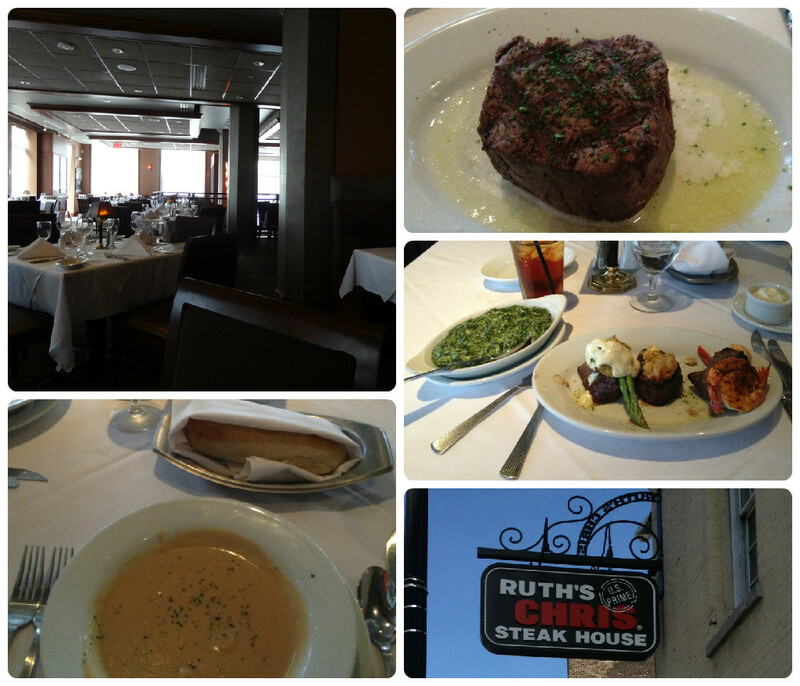 Ruth’s Chris Steak House: Yes, another chain restaurant! However, I had never been to a Ruth’s Chris (though the hubby has on several occasions), and since we were celebrating our anniversary, we decided to go for the gusto. The service we received was up to the restaurant’s reputedly exacting standards—my steak was perfectly cooked and flavorful, sizzling on a blazing hot plate and served by an efficient and solicitous waitress; the lobster bisque and wedge salad were delicious as well. The Savannah location on West Bay Street is spacious and elegant, yet intimate enough for a romantic anniversary dinner. 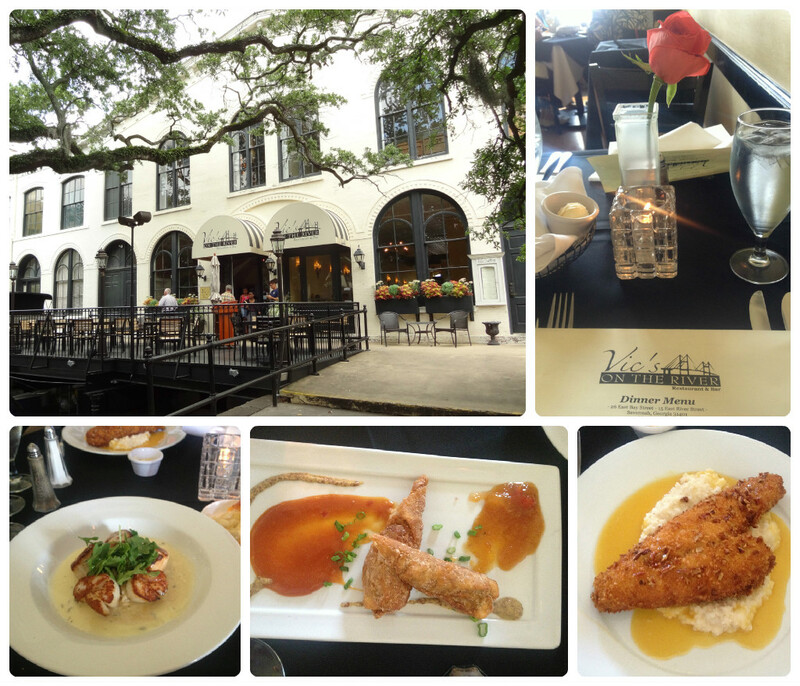 Vic’s On the River: Rounding out my Top Ten Savannah Restaurants list is the last of my top three picks. Another restaurant attractively situated overlooking the waterfront, Vic’s is located between the historic Cotton Exchange building and City Hall. Accessible from either Factor’s Walk or River Street, the restaurant is what I would consider upscale—though we were cutting it close on making our reservation after our sightseeing took us further away than expected, and we ended up wearing our “tourist” clothes to dinner. We ate in the main dining area, but I think there may be outdoor veranda seating as well. The food was excellent and the service equally so. The hubby opted for Pan Seared Jumbo Scallops with citrus risotto and lemon herb truffle butter; I ordered Pecan Crusted Local Flounder, but substituted smoked cheddar stone ground grits for the Andouille sausage-potato hash. This was one of the pricier meals we sprung for during our visit, but entirely worth it! Another restaurant that was highly recommended to us is Mrs. Wilkes Dining Room—a boarding house-style restaurant where everyone eats family-style around large tables set for ten. Doors open promptly at 11:00 a.m. and the line forms way before that. 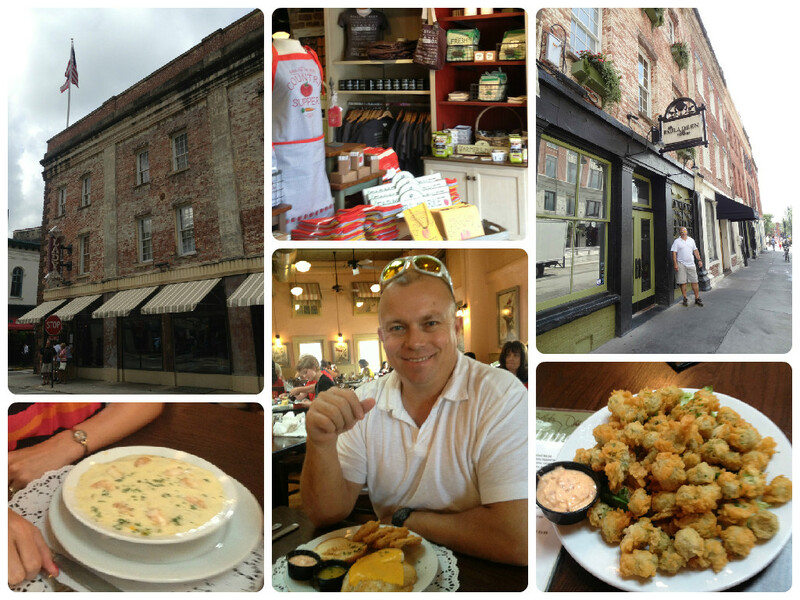 My hubby’s cousin’s visited shortly after we did and decided to brave the crowds and experience true Southern dining. They had a great time and were not disappointed. Hope these tips are helpful as you map out your Savannah dining experience. I found it to be one of the most fantastic “eating cities” around! So much so that I had to immediately go on a diet when I got home!! 😉 Do you have an eating recommendation for Savannah, or comments to share regarding restaurants I have listed? If so, please share! 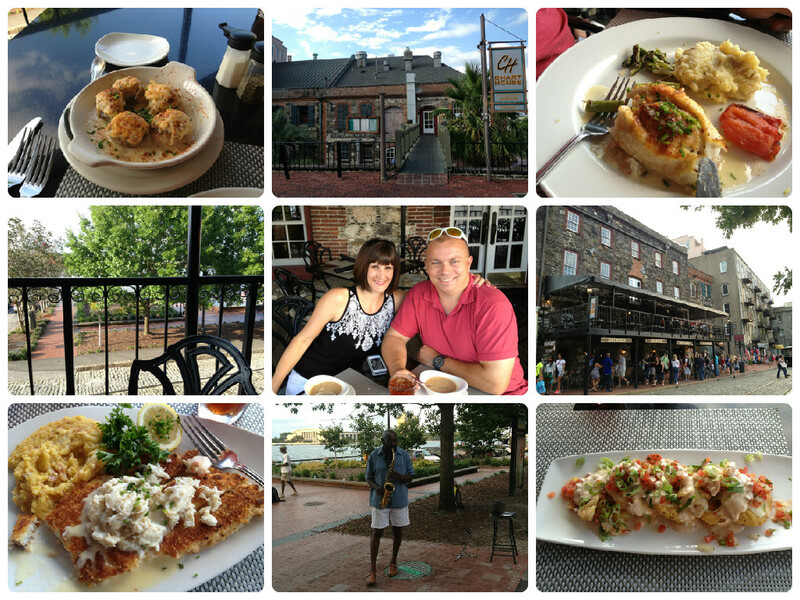 One thing there is no shortage of in Savannah is good places to eat! Whether you crave seafood, lean more toward Southern-style home cooking, prefer a thick slab of meat, or want to grab your grub on the go, you’ll find more than a few options to tempt your taste buds! Here are recommendations and reviews based on our personal experience…listed in alphabetical order. 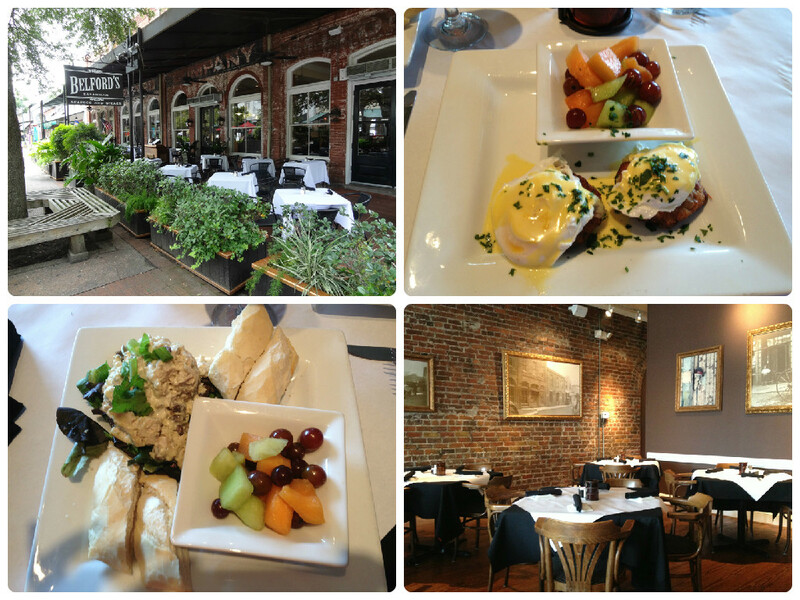 Belford’s: Located in a beautiful historic building in Savannah’s City Market area, Belford’s is casual enough for a quick mid-morning brunch, but chic enough for an evening dining experience. Make your selections from an award-winning menu that ranges from Eggs Benedict and chicken salad (our brunch choices) to seafood and steaks, followed by mouth-watering desserts. Belford’s ranks in my Savannah Top Three. Chart House: Another of my Savannah favorite eating establishments, the Chart House is a high-end chain restaurant-that-doesn’t-feel-like-a-chain-restaurant. Part of the Landry’s group, it faces Bay Street, but also offers balcony and patio dining overlooking River Street and the Savannah River—in addition to posh inside dining. We requested seating on the second-floor balcony where we were treated to a saxophone serenade throughout our meal. The fried green tomatoes were some of the best I have had! This seafood and steakhouse also ranks in my Savannah Top Three. 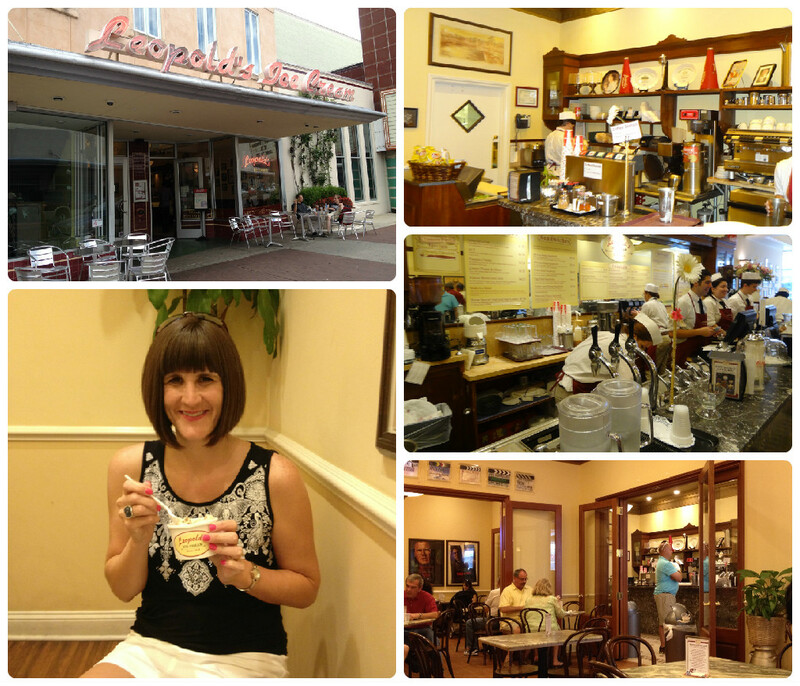 Leopold’s Ice Cream Parlor: The hubby is an ice cream fanatic, so Leopold’s was a “must do” for us! 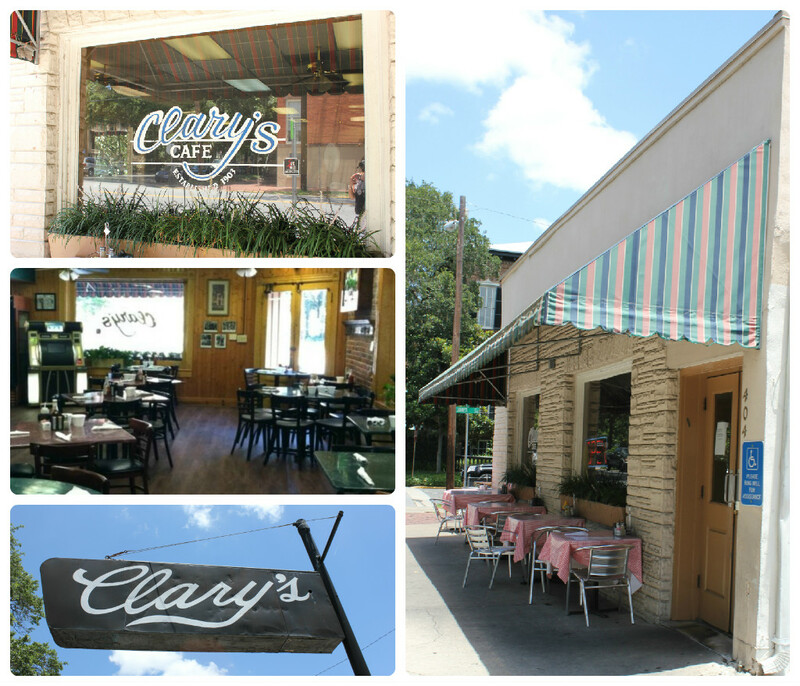 This old-fashioned ice cream parlor features a marble soda fountain, white-hatted “soda jerks,” original recipes dating to the early 1900s, and enough nostalgia to trick you into thinking you have traveled back in time! The line was fairly long and the wait fifteen to twenty minutes, but it was well worth it! 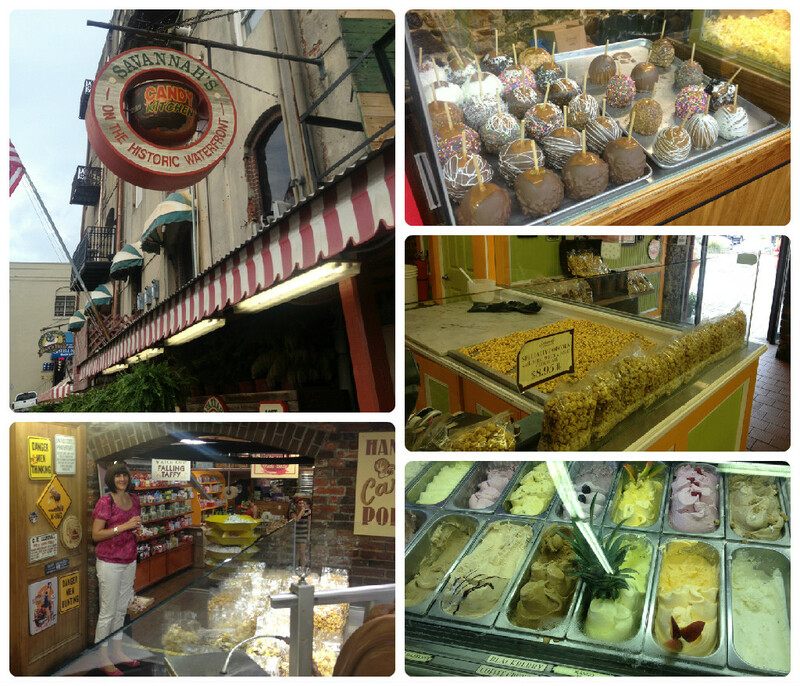 I later learned that Leopold’s was ranked #5 on the “10 Best Ice Cream Shops In the World” list (Toronto Sun, 2011)! Whether visiting Savannah during National Ice Cream Month (July) or at any other time, be sure to stop in at Leopold’s and savor the sweet life…butter pecan, mint chocolate chip, lemon sorbet, tutti frutti…! 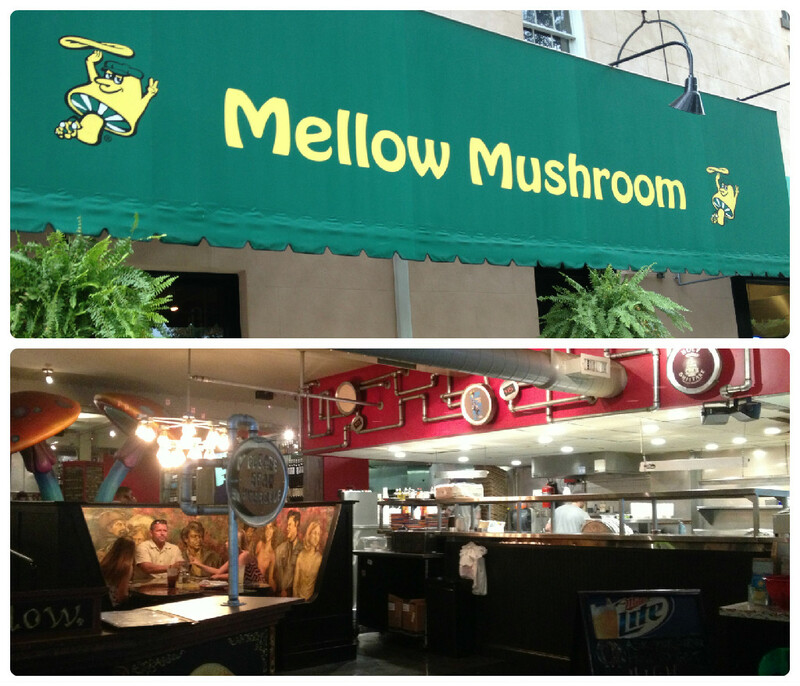 Mellow Mushroom: Okay, I will be the first to admit that I am not into the whole hippy scene—which pretty much sums up the ambiance at the Mellow Mushroom. Stepping inside this “far out” pizza joint is like stepping back into the decade of my birth and childhood (the 1970s)! Obviously, they are proud of their roots and, to their credit, have stuck to them most authentically! As for the pizza, it was quite delicious—and didn’t appear to contain any illicit drugs…haha! Great option for a quick meal or—as in our case—practical carry-out. Check back for additional restaurant reviews and recommendations in “Where to Eat in Savannah…Part 2.” Until then…bon appétit! River Street and the Waterfront: Be sure to walk along the riverfront—both on the upper level along Factor’s Walk and Factor’s Row and also on the lower level along the Savannah River. The majority of these buildings are restored cotton warehouses. Several of my favorite attractions in this general vicinity include the Waving Girl Statue, the World War II Memorial, the Cotton Exchange Building, the Old Harbor Light, the Old City Exchange Bell, and Washington’s Guns. You can also stand on the spot where General James Edward Oglethorpe landed in 1733. River Street is home to restaurants, pubs, hotels, galleries, boutiques, open market stalls, and riverboat cruises. Ships of the Sea Museum/William Scarbrough House: Not only does this pristine historic home contain a notable and expansive collection of all things nautical (model ships, ships in a bottle, figureheads, instruments, implements, uniforms, bells, tableware, correspondence…), it also has the largest gardens in the historic section of Savannah. Both are worth your time! 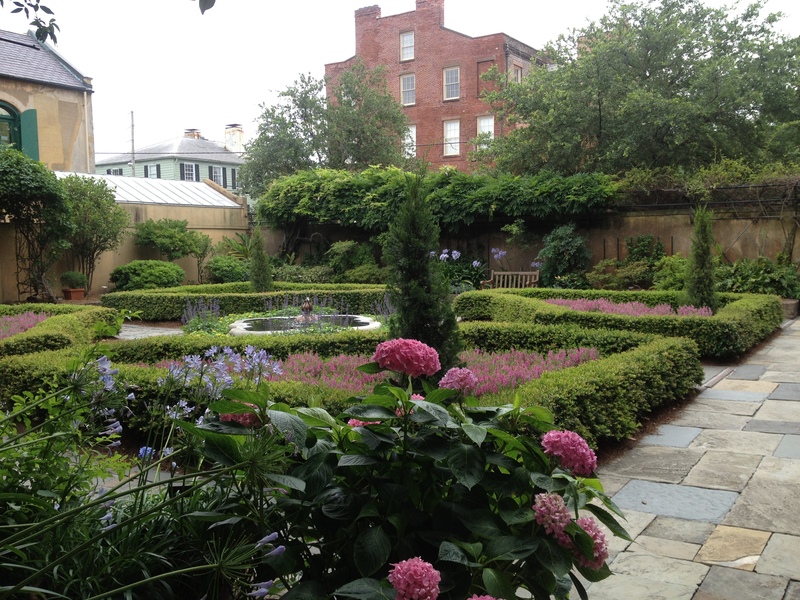 Laid out as a typical 19th century parlor garden and later expanded, Scarbrough Gardens abound with trees and flowers of all kinds as well as a koi pond and—of particular historic interest—the official United States Government weather station which stood in Savannah from 1870 until World War II. Georgia State Railroad Museum: My great-grandfather was a railroad roundhouse foreman, so this museum (and fully functioning turntable) was quite fascinating to me. As part of the most complete antebellum railroad complex in the United States, it is a National Historic Landmark. We saw rail cars from various eras and got to climb aboard several. We also toured the blacksmith shop, the workers’ garden, and the storehouse and enjoyed close-up views of the turntable and a model of the city of Savannah—complete with working trains. I understand that you can take an actual train ride at certain times. This was actually one of my favorite attractions in Savannah! Battlefield Memorial Park: Recreated to immortalize the “Siege of Savannah,” a costly battle fought during the American Revolution, this replica of the Spring Hill Redoubt stands a short distance from the actual fighting ground and serves as a memorial to those Savannah patriots who gave their lives in 1779. There are many, many other things to see and do in Savannah, including the Telfair Museum, SCAD Museum of Art, and various Girl Scout-related sights (Juliette Gordon Low birthplace, Girl Scout First Headquarters, and Louisa Porter Home/Location of the First Girl Scout Meeting). Additionally, there are homes, churches, and government buildings—some of which I will cover in future posts, so check back! Trolley Tour: Anytime I visit a city for the first time—or even as a repeat visitor—I find that this is a great way to get the lay of the land and begin to formulate a plan. 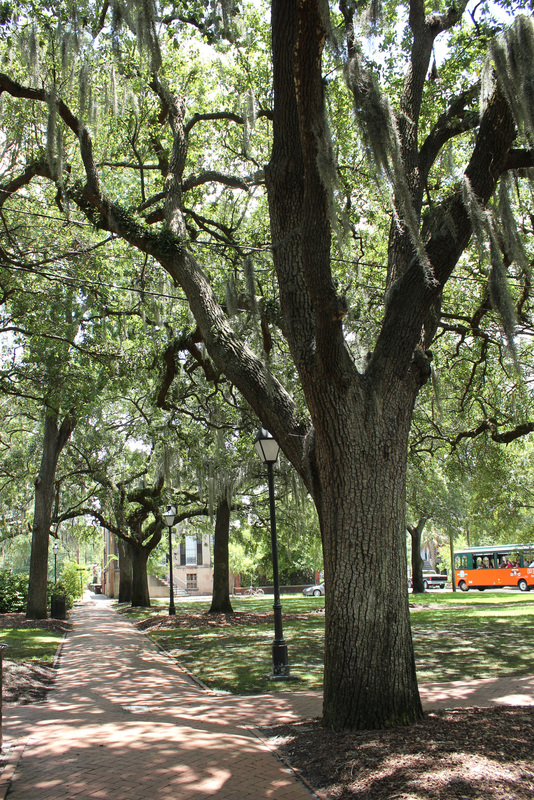 Savannah has a number of trolley tour options—Old Town Trolley Tours, Oglethorpe Trolley Tours, and Old Savannah Tours. We had not done any real research before arriving so went with Old Town Trolley Tours. We had to wait for a second trolley as the first one that came by was full. The tour was informative and interesting. We were not happy at all, however, when we discovered that the tour ends promptly at 5:30, at which time we were dumped at the Visitor Center and forced to walk a fair distance back to the main drag. No one told us that when we purchased our tickets, so be sure to check the time schedule to avoid finding yourself in this predicament! The locals we spoke to later recommended Old Savannah Tours, complete with guides attired in authentic Southern garb. I think we will give them a try next time around. Most, if not all, of the trolleys offer hop-on, hop-off service, which is quite convenient. Carriage Tour: Climb into a horse-drawn carriage for a tour of the historic district if you prefer. Public or private tours are available through Carriage Tours of Savannah, Historic Savannah Carriage Tours, or Plantation Carriage Company. You might want to book in advance—particularly during the busy season. Walking Tour: I find that a local guide adds so much to the tourist experience! I generally make arrangements for a private tour whenever I visit a new city. Granted, this can be a bit pricey, but I find it worthwhile as it guarantees that I will see the most important sights while efficiently budgeting my time. I try to schedule the tour for the second day so that I have plenty of time later to follow up on anything that piques my interest or that I would like to explore in greater depth. If a group tour is more to you liking, you might stop by the Savannah Visitor Center or consider Savannah Walks. Another option is a self-guided walking tour. I purchased a fabulous Guide for about seven dollars at Parker’s Market. It is called The Savannah Guidebook Including 4 Unique Walking Tours. I highly recommend it! Or you can drop by the Visitor Center and pick up self-guided walking, driving and bike tours, free maps and brochures on local attractions. City Market: This four-block area in historic downtown Savannah is a throwback to the city’s open market of bygone days. With restaurants, entertainment, art galleries, gift and specialty shops (I quickly ran inside one of these and purchased an umbrella when it began to rain unexpectedly), sweet shops, beautiful flowers, and even benches to rest your weary feet, this is a great place to browse, rest, or purchase tickets for a trolley or carriage tour. 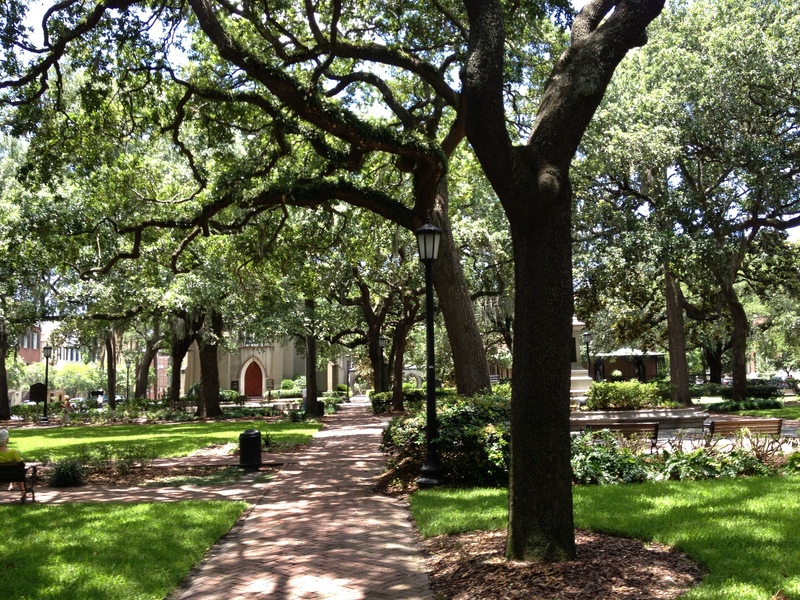 Forsyth Park: Dating back to the 1840s, this serene and beautiful park was envisioned by General Oglethorpe and later laid out and named for Governor John Forsyth. Visitors are drawn to the regal Forsyth Fountain which stands as the park’s crowning glory. 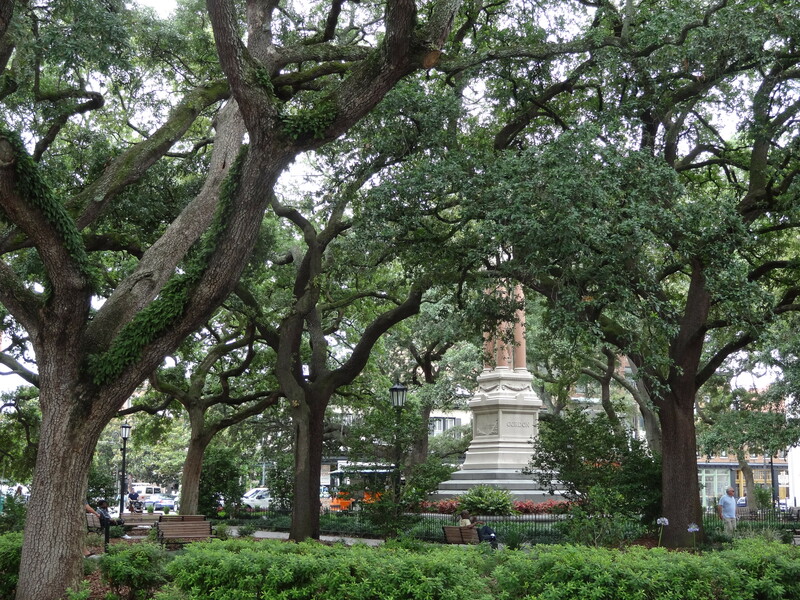 Likely the most photographed thing in all of Savannah, the cast iron structure is said to have been modeled after the fountain in Paris’ Place de la Concorde. (While by no means identical, there is a resemblance.) Also located in the 20-acre park is the Confederate War Memorial, dating back to 1879. This is a great place for a stroll or simply for quiet contemplation. The park plays host to a variety of cultural events throughout the year. 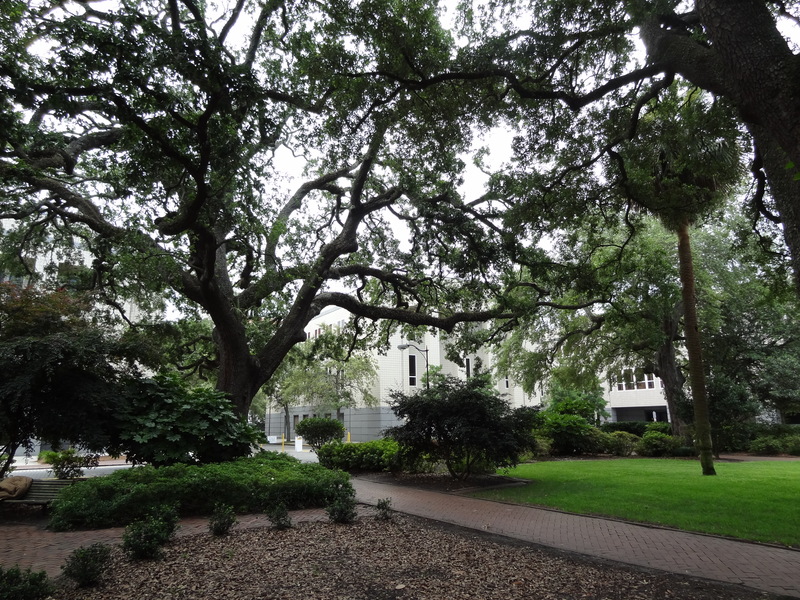 Johnson Square: Named for Robert Johnson, who was the Royal Governor of South Carolina when Georgia was founded in 1733, this was the first square built in Savannah. 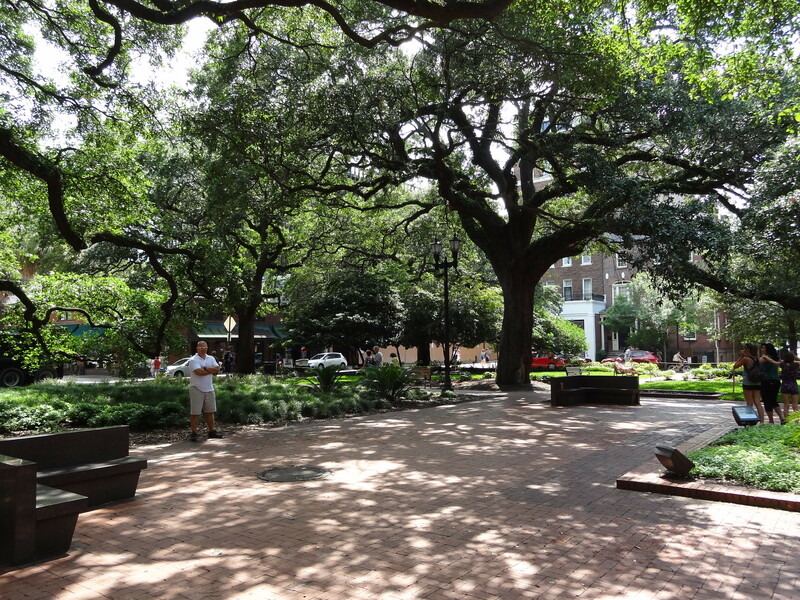 Calhoun Square: Named for South Carolina native and U. S. Vice President John C. Calhoun, this is the only square with all original buildings intact. Chippewa Square: Also known as Forrest Gump Square, it was named for the Battle of Chippewa—an American victory over the British during the War of 1812. 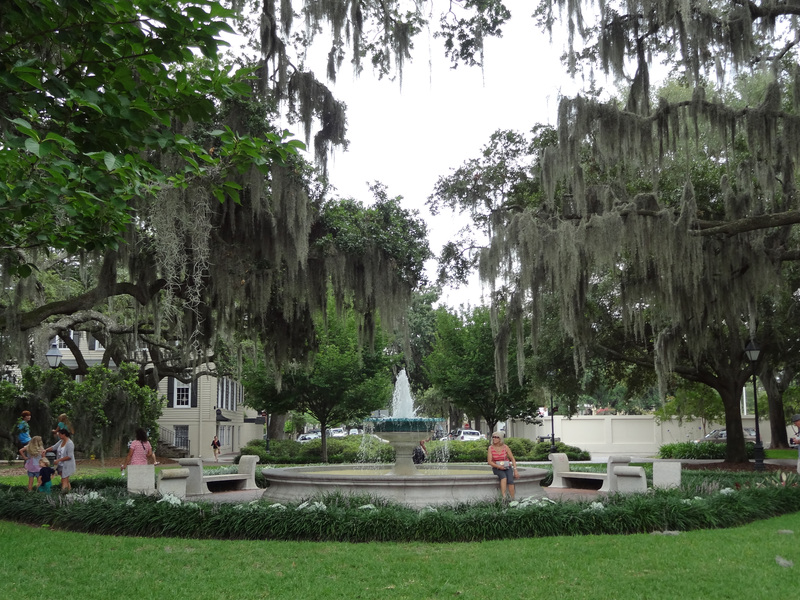 Columbia: Named for America, this lovely square centers around a fountain from Savannah’s historic Wormsloe Plantation. Ellis Square: For a time, this square—one of the original four—was swallowed up by a parking lot. It was reclaimed a few years ago and is the most “modern” of the squares. Franklin Square: This square was named for Benjamin Franklin. 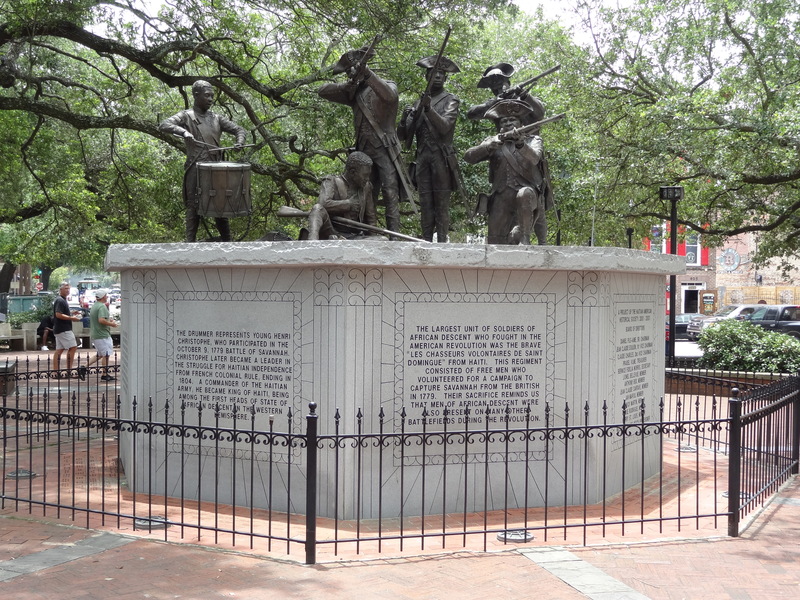 The monument above was erected to honor Haitian veterans of the American Revolution. 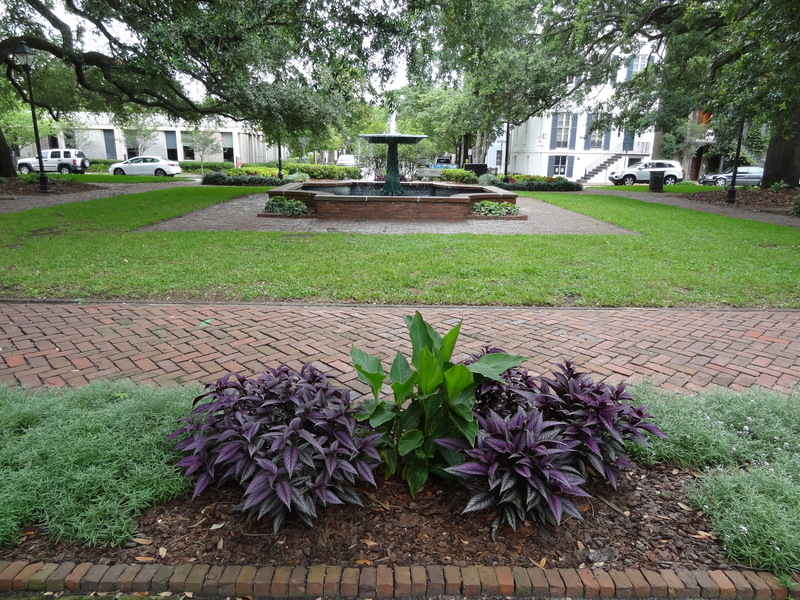 Lafayette Square: Named for the Marquis de Lafayette, a wealthy Frenchman who assisted the U.S. during the American Revolution, this square contains a fountain dedicated by the Colonial Dames of America. Madison Square: This square was named for the fourth U. S. president, James Madison. Monterey Square: Possibly best known as the scene of the crime in “The Book,” this square commemorates the Battle of Monterey during the Mexican-American War. It is considered by many to be the most luxurious of the city’s squares. Orleans Square: This square commemorates the heroes of the Battle of New Orleans. 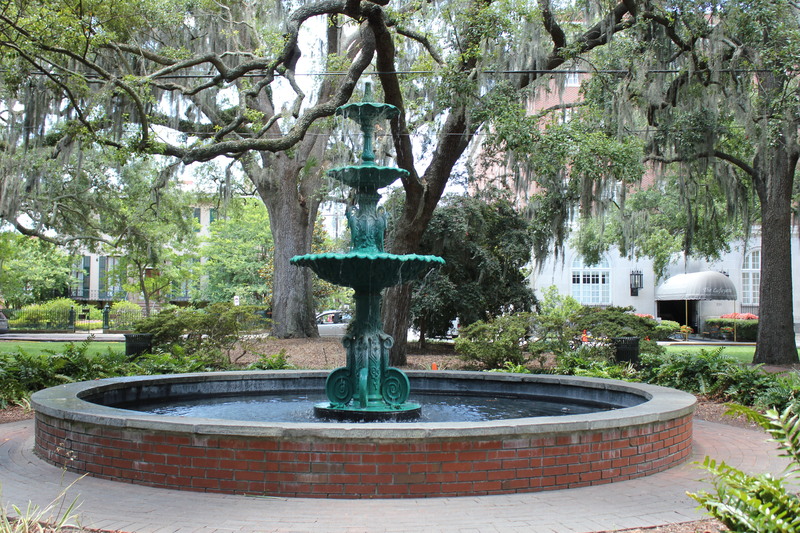 The fountain was erected in honor of Savannah’s German immigrants. Reynolds Square: Originally named Lower Square, the current moniker honors John Reynolds, the first Royal Governor of Georgia. 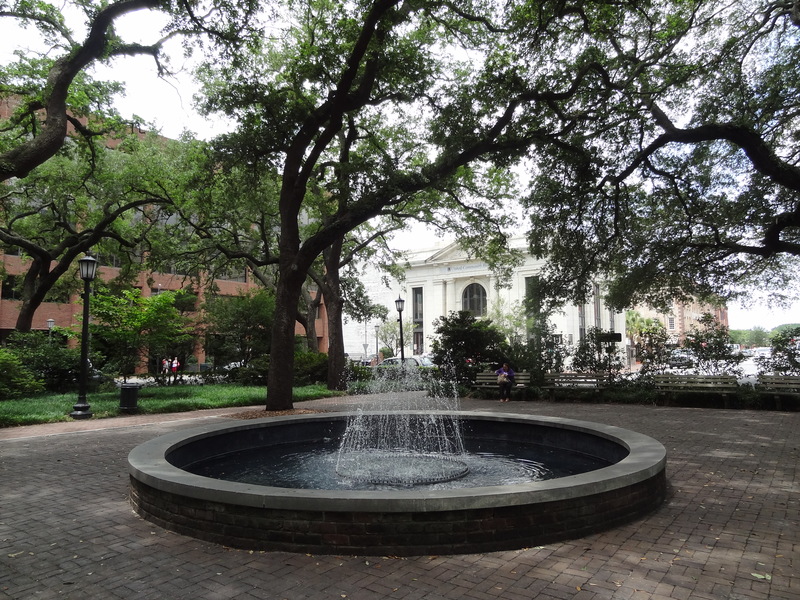 Telfair Square: One of the original four squares in Savannah, it was first called St. James’ Square after the royal residence in London. It was later renamed in honor of Edward Telfair, philanthropist and governor of Georgia. 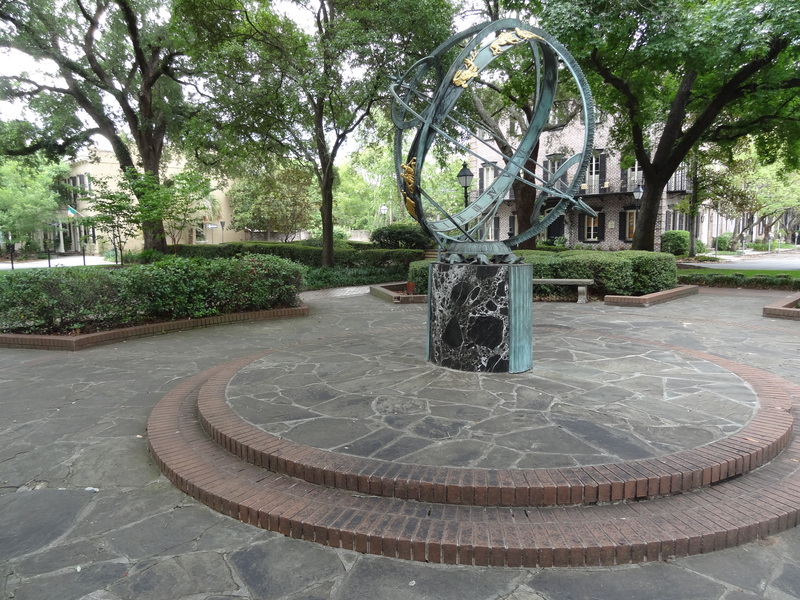 Troup Square: Named in honor of George Michael Troup, a Senator and Governor of Georgia, this square contains an unusual sculpture—an astronomical device known as an Armillary Sphere. 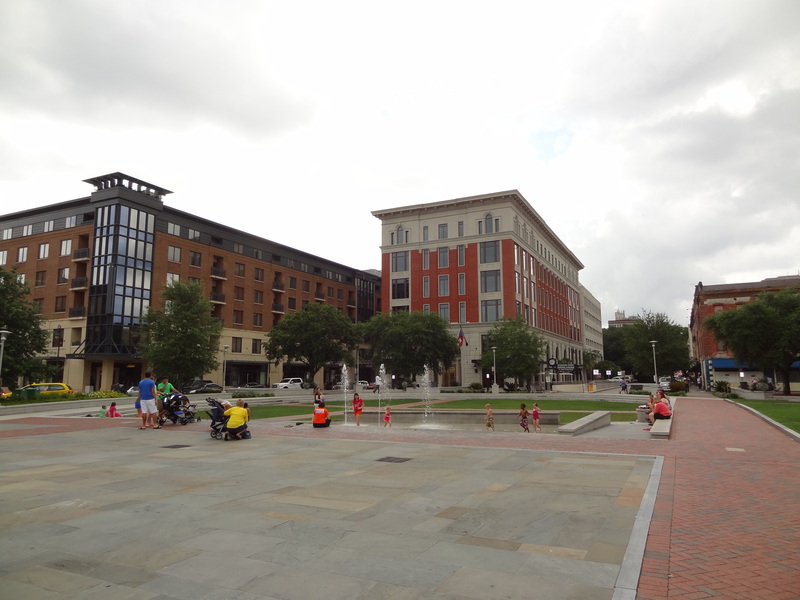 Wright Square: The last of the original four squares, it has also been called Upper Square and Percival Square. It’s current name honors the last Royal Governor of Georgia, Sir James Wright. 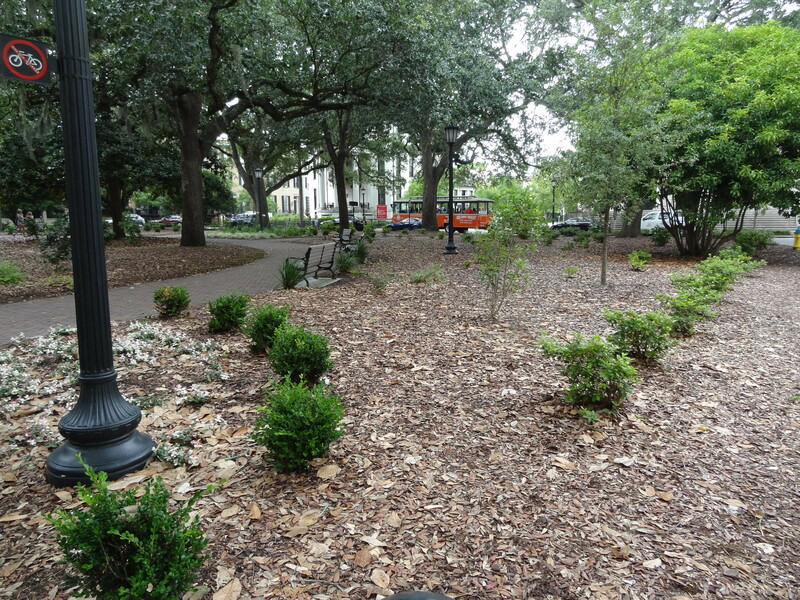 These squares are now lovely parks in the heart of historic Savannah. Each has its own unique character, but all are tranquil and beautiful. Sadly, Elbert and Liberty Squares have fallen victim to urban sprawl and no longer exist. In addition to the fourteen squares I have covered above, there are eight others—Chatham, Crawford, Greene, Oglethorpe, Pulaski, Warren, Washington, and Whitfield. I hope to eventually make it back to Savannah and see those as well! 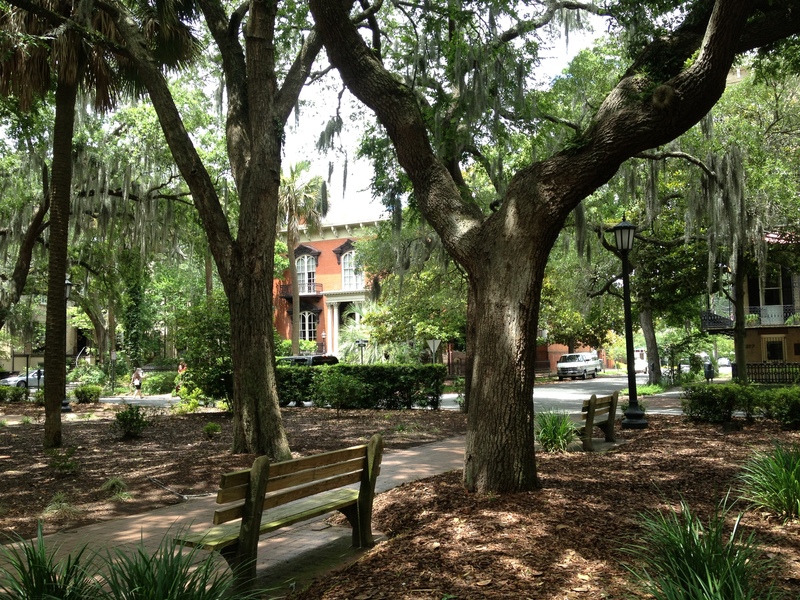 For more information about Savannah’s historic squares, or to learn more about visiting the city, click here.